Hobbits & Hairdye: Úna Brennan Pore Purifying Clay Mask. Úna Brennan Pore Purifying Clay Mask. I love a face mask I do, nothing better when your having a pamper evening than a face mask, they're so girly but I also always feel like they're doing good things to my skin. The Una Brennan skincare range has always appealed to me, but never really been something I've stepped into, so I thought I'd ease into my first purchase with a face mask. I went for the Tea Flower Deep Clean Pore Purifying Clay Mask, the thing that appealed to me most about this one was that its meant to be good for pores, and I suffer from quite prominent pores. It is said to contain Salicylic Acid proven to help unclog congested skin and oil-absorbing Dead Sea Mud rich in magnesium, calcium, potassium and iron for the perfect detox facial at home. Sounds good right? I was really drawn to the fact that its oil absorbing, as I suffer from quite oily skin. It also contains Avocado oil rich in Vitamins A, D and E with Acacia Honey further help skin rebalance itself to reveal a clearer, refreshed-looking complexion & to clear your skin of dirt, excessive oils and toxins which lead to breakouts. For me, it sounded pretty impressive so I picked up the 125ml tube for £8.99, what I really like about face masks that come in tubes is that they last a really long time, you can get so many uses out of them. I've had this for quite a while now & haven't even got half way through it, that for me makes up for the price tag. First impressions, this smells incredible, I don't really know what Tea flower smells like, so I don't know whether it smells like that, but it really smells so good. Its got a very fresh scent which I like as its not too artificial, it smells like its doing good things to my face. I use this once a week, or whenever I have a pamper evening. To use: Apply a generous and even layer to a thoroughly cleansed face and neck. Leave on for 5 minutes to maximise the hydrating benefits. Rinse with warm water, or soft flannel dampened with warm water and gently pat skin dry. It really does make a difference if you use it on already cleansed skin, every time I use this and take it off my skin feels incredible, it feels fresh and new and clean & I have found it actually works, its made my pores look and feel less noticeable, that may just be to me, but its made me feel so much better about my skin! I really can't sing its praises enough, I would highly recommend if your looking to give a clay mask a go, I really want to try some of the other face masks from the Super Facialist range. 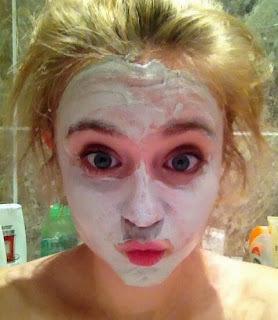 (and of course an obligatory face mask selfie) Don't I look fetching! Have you tried this mask? Your thoughts? Have you tried anything from Una Brennan? Whats your favourite product?